I am Ganesh Munusamy from HANA Product Support based out of Vancouver, Canada. I am part of support team for more than 3 years. I have been seeing a growing number of security related questions from customers. This blog will cover step-by-step configuration of SSL for internal communication and system replication. I hope this will help you guys out. Security is one of the most significant feature any product should posses. In SAP HANA, we can precisely configure both internal and external communication. Here we will be seeing how to configure server-side SSL manually, when you do not want to use the default system PKI (public key infrastructure). But remember, SystemPKI is the suggested recommendation from SAP to use for securing SSL communication. Follow steps mentioned below if in case you wanted to use own server certificate for internode communication and for System Replication. For HANA 1.00, In-Database configuration is not supported for internal communication between servers and for system replication communication. OpenSSL can be used to create server certificate. With CommonCryptoLib, you can also use SAP Web dispatcher administration tool or SAPGENPSE tool. Do not password protect keystore file which contains servers private key. The recommendation from SAP is to use a private CA for each host, but here I will only show how to create certificate and sign them in one host. You will just need to follow the same steps in other hosts if you are using multi-host environment. I am here using a 3 node system, MN1, vandevvmlnx011/012/013. This will ask you to enter PEM pass phrase, I used my SYSTEM user password for test, you may use it per your convenience. Also have to enter other details like country, state, locality etc. Do not enter password when requested for PSE PIN/passphrase as it is not supported! Also, to secure internal communication, canonical name should be host specific, eg CN=”<hostname_with_domain>”. So when creating private CA on each host, parameter CN will be unique. But here in this example below, I specified CN=”*.xxxx.xxxx.sap.com”, which is good for system replication scenario, but not for internal communication between hosts. Note: You can also get this signed through your CA, if doesn’t want to self-sign it. Please note that a private certificate have to be created for each host in the multi-host system. So follow the same steps that we did above to create a sapsrv.pse file and sign & import it, in other hosts as well. Set value for parameter ssl = on and make sure sslinternalkeystore and sslinternaltruststore has correct file pointed to. 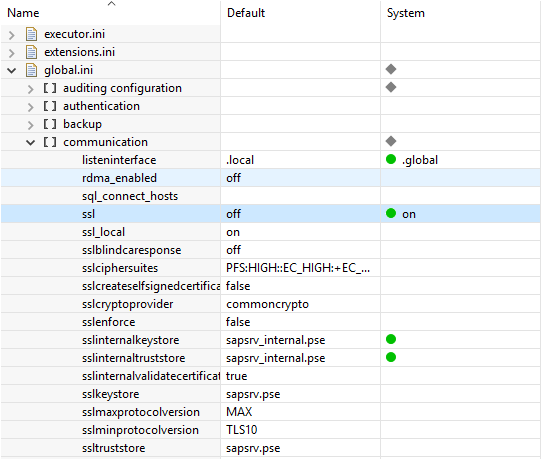 sapsrv_internal.pse is the file we created and so the parameters sslinternalkeystore and sslinternaltruststore has that value. In case to secure communication for system replication, primary and secondary each will have one .pse file only. When creating the server certificate, we provide the canonical name (like CN=” *.prod.sap.com”), which should be same for both primary and secondary. So when creating certificate for system replication scenario, no need to have separate .pse file for each host. Communication between sites (metadata and data channels) require the same configuration as we did above in global.ini/[communication] section. However to secure data communication, we must set parameter enable_ssl = on, under section [system_replication_communication] of global.ini file. Now communication between hosts and communication between sites in system replication scenario are all secured using SSL.